Dual entry allows you quick access to the bathroom or the main living and kitchen area when having fun outside. 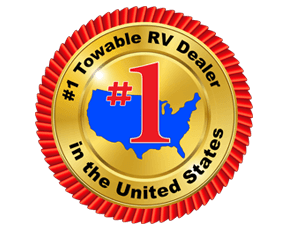 If you have been searching for a travel trailer that sleeps nine to ten people, plus includes lots of storage, your search is over! You will find a space for your linens, clothes, dishes and food, plus the exterior pass through compartment allows you to stow away camping chairs, fishing poles, charcoal and such. The L-shaped kitchen offers plenty of room to cook while everyone is moving about. You will love the natural lighting provided from all the windows and the skylight. Take this model with you today! 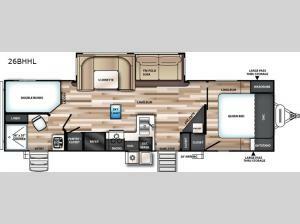 With any Wildwood Heritage Glen Hyper-Lyte travel trailer by Forest River, you will feel right at home with Shaw residential stain resistant carpet, Shaw Guardian hickory way linoleum, and a Jensen 32" HDTV with Bluetooth CD/DVD/FM/USB player and bar speakers. Every unit comes standard with a queen Denver 9" pillowtop mattress for a peaceful night's rest. You will love that you can bring everything along with these units thanks to the extra-large pass through storage in most models, and every travel trailer features a power tongue jack with an LED docking light that is super convenient when it's time to hitch up and head home.